ISLAMABAD: Pakistan and Kuwait discussed ways to enhance cooperation in diverse fields in a meeting between the President of Pakistan, Mamnoon Hussain, and Ambassador of Kuwait to Pakistan, (His Excellency) Nawaf Abdul Aziz Alenezi. President Mamnoon hosted a special family lunch in honor of the Kuwaiti dignitary at the President House in federal capital Islamabad. 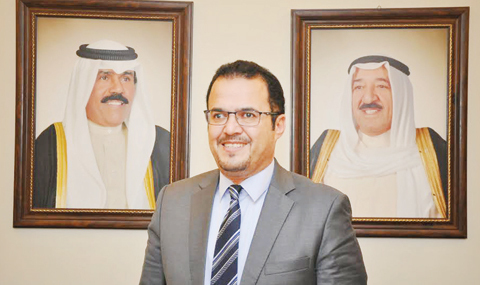 In an exclusive interview with KUNA yesterday in this regard, the Kuwaiti envoy said main purpose of the meeting was to extend an invitation to the President to visit Kuwait, on behalf of His Highness the Amir of the State of Kuwait, Sheikh Sabah Al Ahmed Al Sabah. The President expressed gratitude for the invitation and addressed well wishes to His Highness the Amir. He appreciated the efforts of His Highness the Amir for the cause of humanity and its welfare. During the meeting, the envoy recalled the high level visits by Kuwaiti dignitaries including His Highness the Amir in 2006, His Highness the (Deputy Amir) and Crown Prince Sheikh Nawaf Al Ahmad Al Jaber Al Sabah in 2013 and Speaker of the Kuwait National Assembly (Parliament), Marzouq Ali Al-Ghanim, in 2015. In a discussion with President on the issue of current crises faced by Muslim world, the Ambassador said, “The militant groups like so-called Islamic State are damaging the image of Islam and Muslim Ummah (nation) need to maintain a uniform stance against them to combat terrorism.” On a question about relaxation of Kuwait visa policy for Pakistani community, the Ambassador said the President emphasized need of relaxation of family visas by Kuwait to Pakistani community. He assured the envoy that no militant would land on the Kuwaiti soil from Pakistan as over 80 percent of the militants are eliminated from Pakistani soil through military operations against them. Answering a question about the political relationships, the envoy said President Mamnoon was of the view that the political leaderships of the two countries must visit each other more frequently in order to enhance the bilateral ties. “The frequent visits by the political leaders would help both countries to develop a uniform stance on the issues of common interests in the international platforms like United Nations and Organization of Islamic Cooperation,” the Ambassador quoted the president as saying. On a question regarding the enhancement of defense ties between the two brotherly countries, the Ambassador told KUNA, “Kuwait admires the advance military and technological capabilities of Pakistan.” The President briefed the Ambassador about the latest military products of Pakistan including the JF-17 Thunder fighter jets, latest tanks and advance missile/radar system of the country. In this context, the Ambassador also recalled the recent visit of the Kuwaiti Air Force Commander Maj Gen Abdullah Yaqoob Jasim to Pakistan during which both countries agreed to enhance defense ties. The Air Force Commander also visited an exhibition of the latest weapons made by Pakistan and appreciated country’s technical advancements in the field of defense. On a question related to economy, the Ambassador said Pakistan and Kuwait agreed to enhance the trade volume between them. During the meeting, the President urged the chamber of commerce of both countries to increase visits and emphasized introducing each others products to their respective markets and ensuring the product access to the market. Discussing the import of manpower, the ambassador said Kuwait has agreed to import technical manpower from Pakistan and has hired 200 doctors recently from the brotherly country. Commenting on Pakistan-India relationships and recent surprise visit by Indian Prime Minister Narendra Modi to Pakistan, the envoy said Kuwait welcomes this visit and considers it as a positive step towards peace process between the two countries. He expressed hope that this visit will play a significant role in resolving the outstanding issues between the two neighboring countries. On the under construction mega project, the China-Pakistan Economic Corridor (CPEC), the Kuwait Ambassador noted that CPEC will play a vital role in boosting up the trade volume and economic conditions of Pakistan and the central Asian countries. The trade route will cut the distance and save the time resulting in the increase of trade volume and better access of commercial goods to international and Gulf markets, said the Ambassador.